Choosing a person to be the voice of Lincoln is a tricky business. Staff listened to several rounds of actors auditioning for Lincoln and still could not agree that any sounded like the President. We each had our own personal idea of how he sounded and, without a playable recording of him, it’s open to interpretation. For example, we knew how old Lincoln was, but that only put us in a general range. He lived in Kentucky, Indiana, Illinois, and finally Washington, D.C., but accents can be strong or mild—not to mention we’re talking about an accent from 150 years ago. Environmental impacts on his voice are uncertain. Contemporaries commented on his voice having a higher pitch, but people have different ideas on what constitutes a high-pitched voice. Finally, we held an ad hoc round of local auditions, asking lawyers and others who study rhetoric to send in tapes of themselves reading one of the quotes we’ll use on the tour. We found our Lincoln in the voice of a National Park Service employee who testifies on the impact of development adjacent to park land. 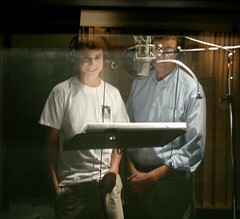 We recorded him (along with the voice of Tad) last week and are very excited about the results.